The box contained the usb box, a usb cable and a manual in probably Chinese (A manual is not needed to figur out how this box works). 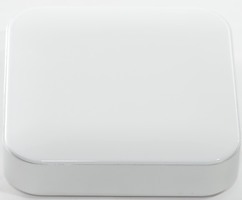 The box has white top and bottom with aluminium sides. Everything in the user interface is collected on one side. The box has two usb outputs and one micro usb input. There are 3 blue leds used to show charger state and function and a push button. The leds can show charger state when the button is pressed. They show a running light when output is loaded and a flashing led while charging. The button is only needed to show charge state and activation after overload or battery replacement. 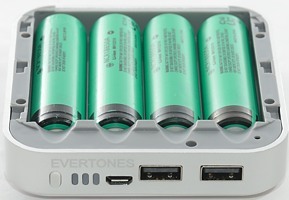 To open the box, the lid slides off and there is space for four 18650 batteries. 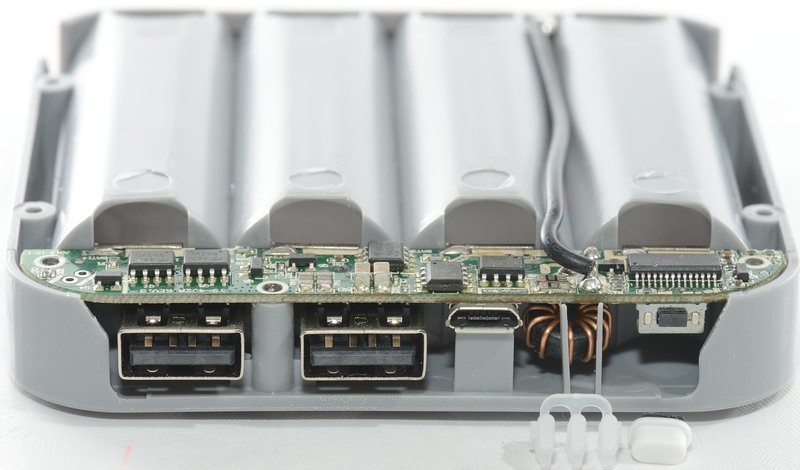 The batteries are not directly in parallel, i.e. it is possible to use batteries with different charge state. The box is designed for unprotected batteries, but I could fit a 68.3mm battery in it (It was a tight fit). This extra length means that unprotected button tops will fit. Here I have put a full load for 3100mAh batteries in it. To get inside the box I had to remove five very small screws. 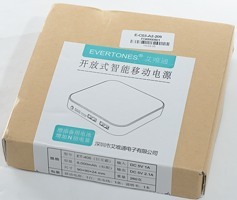 There is a lot of electronic in this box, the reason is that each battery can be connected/disconnected as needed. 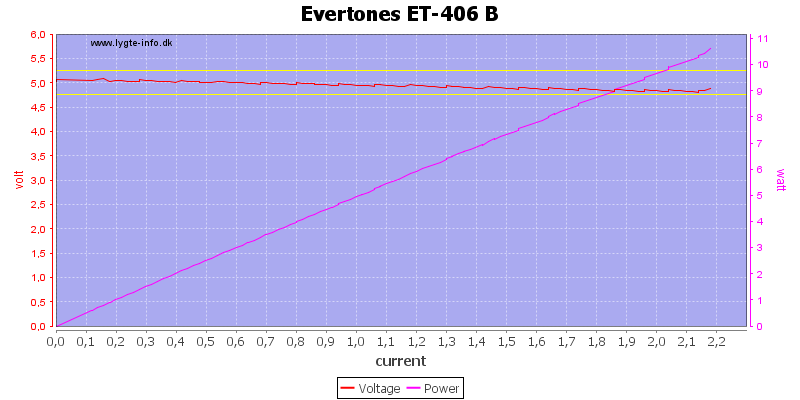 Blue leds is "running" when providing usb power. When the button is pressed in unloaded state, the leds shows charge status (2 leds is on above 3.6 volt, 3 Leds is on above 3.9V). When charging the leds shows charge status and one led is flashing. 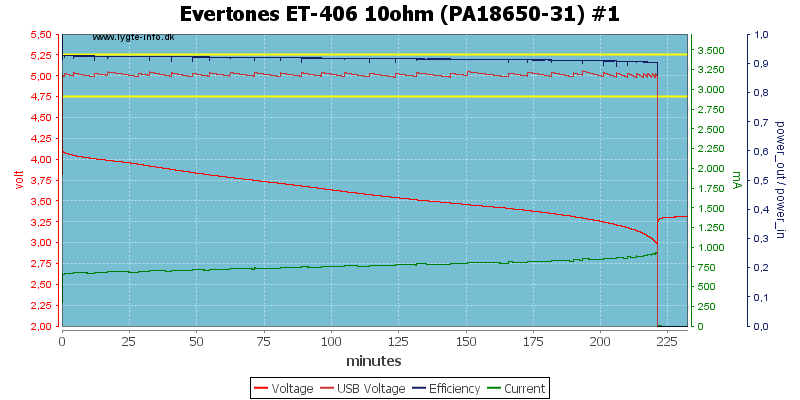 When finished with charging all 3 leds are steady on. The button will activate the box again after battery replacement or overload. When in standby the box drains the batteries with about 3 uA (Very good). Any load on the output will turn it on (It is very sensitive). 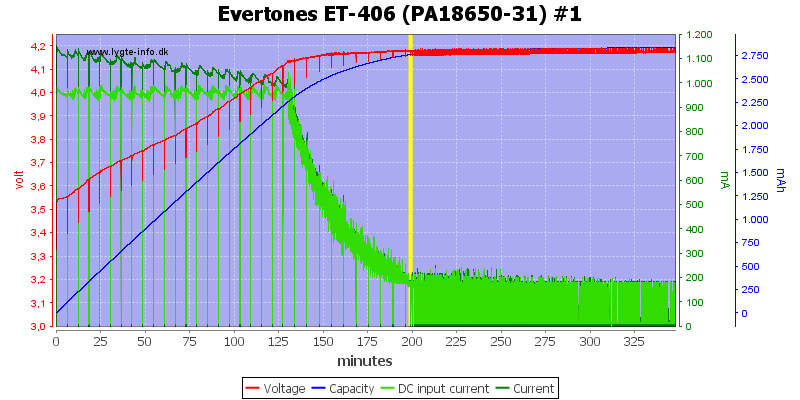 The output needs about 140mA load to keep on else it turns off after about 30 seconds. When the box is charging the usb output is turned off. No problem with mixing full and empty batteries. Both A & B output are Apple 2.1A coded (I would have prefered one Apple, one usb DCP). Output turns off when overloaded, button must be pressed to reenable output. Uses 1A from usb when charging. The two output is has the same current capability and also the same coding. The overload trip point slightly above 2.1A looks good. 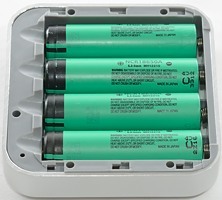 With a single cell and 0.5A load (10 ohm) the box works very good with an efficiency above 90% and it will disconnect the batteries at 3 volt. 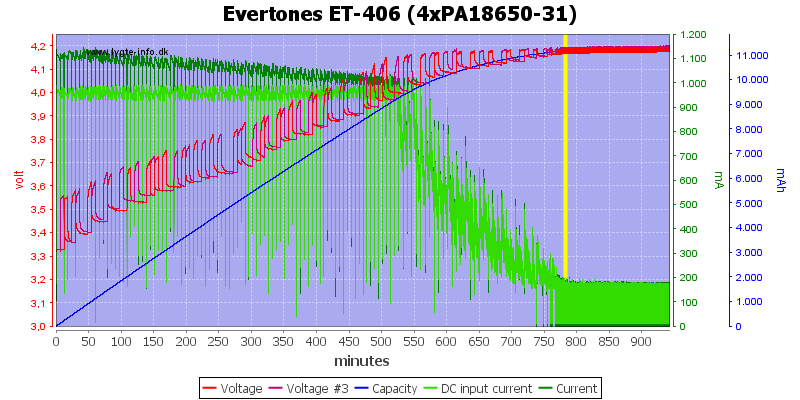 The slight jumping up and down in the output voltage is not noise, it is due to the regulation and will not affect connected equipment. 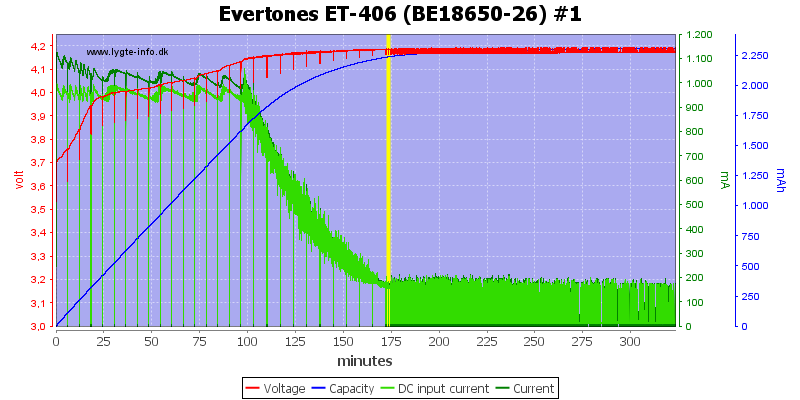 Using other battery capacities works exactly the same, except for runtime. A 0.5A test with four batteries. I had a voltmeter on battery #1 and battery #3. 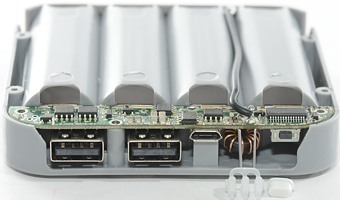 The box connects and disconnects batteries as needed to maintain the output. 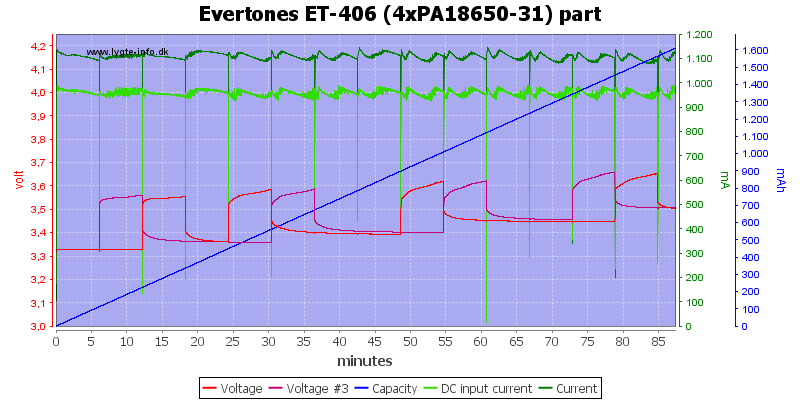 A 2A test with four batteries. Due to the high current the efficiency is lower. Battery #1 runs empty at about 160 minutes, the box continues to work on the other batteries. Here I have zoomed in on the chart from above. As can be seen the battery connect/disconnect is fairly slow with minutes between. At 2A the noise has increased, but it is still a good value with 25mV rms and 195mVpp. The box is charging with CC/CV, but the turn off is not working correctly (it is to sensitive and the box will start charging again). 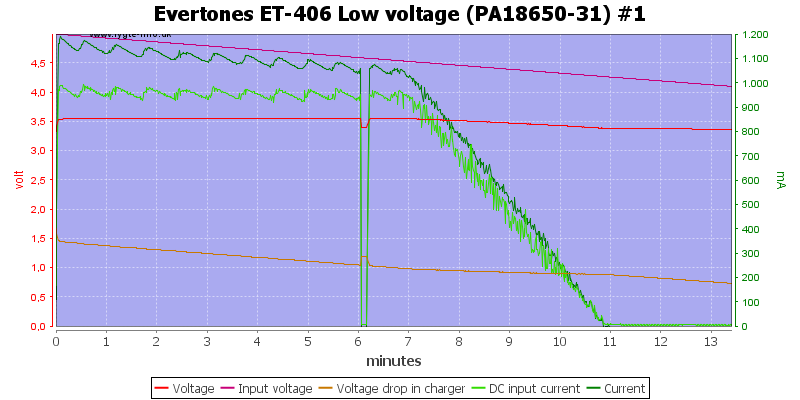 Notice that the "DC input current" is lower than the charger current. This box does not use a linear regulator, but it is reversing the switching circuit and using it for a charge controller (I like it). This box will charge as fast as possible while keeping the usb current at 1A. No surprice with 2600 and 3400mAh batteries. 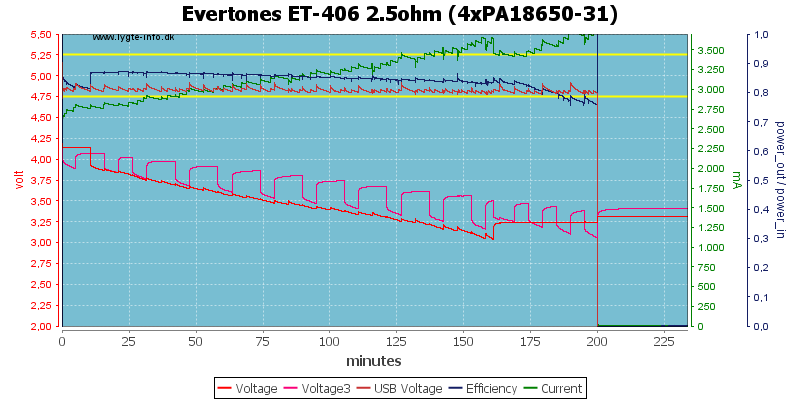 Charging four batteries does take time, here it is about 12½ hour (It is difficult to do it much faster when only drawing 1A from usb). Again I have zoomed in on the chart from above, it looks like every 6 minute the charger decides what battery to charger. 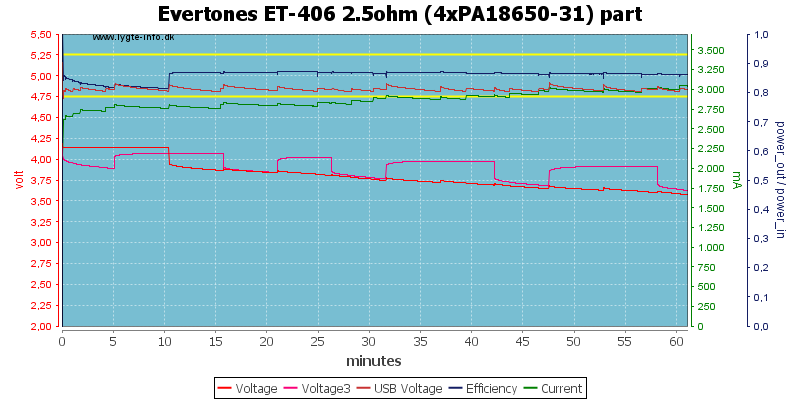 In the chart I am only measuring on two out of the four batteries in the charger. 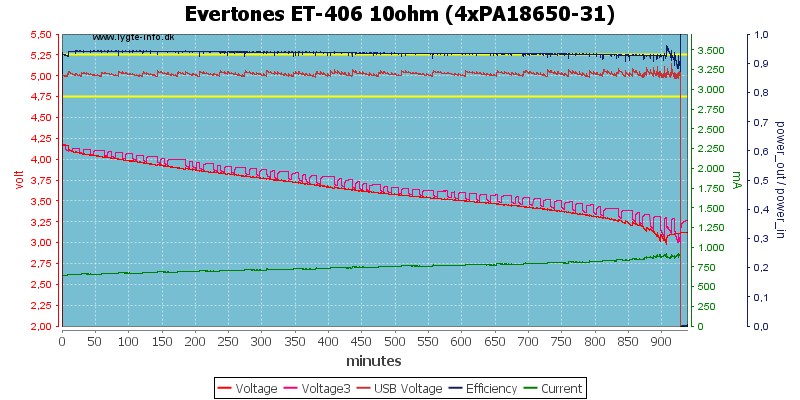 Reducing the usb voltage shows that it can maintain full charge current down to about 4.5 volt, but probably only when the batteries are empty. 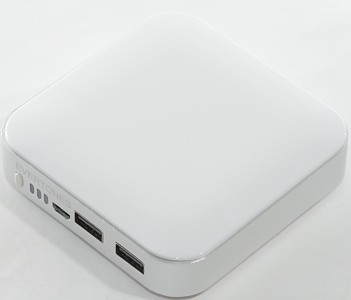 This box has very good electronic for usb output, it can deliver a lot of current with low noise and it will turn off when overloaded. 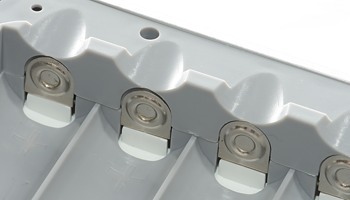 It is very compact for a 4 battery box and the aluminium frame makes it fairly strong, without any sharp points. 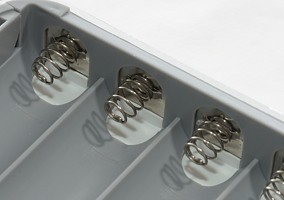 The missing turn off on the charger means that it is important to disconnect the box from power when it is full (Not the same second it is full, but within a few hours), to get the maximum battery lifetime or charge the batteries in another charger. This box does nearly everything correct and I will call it a good usb power box. The usb box was supplied by gearbest.com for review.